Tulum beach is paradise. Hidden behind the jungle, you’ll find miles of white sand at your feet and turquoise water ready to give you a warm hug. Waves or no waves, depending on the patch of beach you’re at, this is the perfect spot to fly. Everyone can kite! Trust us, you’re not too tall, short, skinny, fat, young, old, weak or strong… This is a sport for absolutely everyone wanting to experience the thrill of letting the wind pull you over the sea’s clear surface. Take a lesson with us! 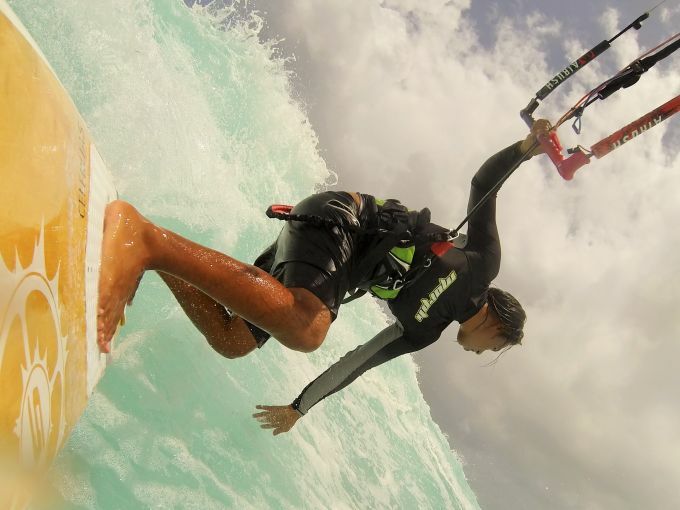 Kiteboarding is a safe sport as long as you take a lesson from certified and experienced instructors. Yes, all our instructors are IKO certified (International Kitesurfing Association). Safety is a priority for us and we’ll make sure you feel comfortable. Whether it’s your first time or you’re a professional, we’ll walk you through the local conditions and cover all safety measures. When will I ride may be your first question… and the answer is, you’ll fly! We offer personalised classes so we’ll move at your own speed, and hey! There’s time in paradise. If you get hooked, like most, you’ll find it to be an awesome sport you can practice in most places that have water and wind. Nature knows best and we listen, check out our calendar to know what’s going on and get in touch! You can send us an email, give us a call or just come visit us at Coco. It’s paradise so please be patient if we don’t have wifi at all times. Here’s a list of prices. Learn more about Caribbean Outdoor Activities. Do you have a question? Get in touch with us!. Carretera Tulum Boca Paila km 4.0 77780 Tulum Q.Roo (Hotel Maria Del Mar). Subscribe to stay updated on all Tulum and water sports news. You’ll also receive exclusive offers! Copyright 2019 CARIBBEAN OUTDOOR ACTIVITIES.